Official Google India Blog: Announcing a Search conference for Indian language publishers! Announcing a Search conference for Indian language publishers! We’re delighted to announce a Search Conference for Indian language publishers. This will be a five-day five-city event in July dedicated to publishers who publish websites in Indian languages. If you are such a publisher, this is the opportunity you may not want to miss. In this day-long conference, members of the Google Search Quality team will talk about a host of topics including how Search works, tips for better visibility of Indian language websites in Google Search, best practices for mobile-friendly websites, Google’s Search quality guidelines and a bunch of other important things. These presentations will be delivered in the Hindi language. We’ll also have a guest session by a member of the AdSense team to throw some light on their policies and how to avoid mistakes while running AdSense in Hindi on your sites. At Google, our mission in India is very simple - Internet for every Indian. A connected India with access to the whole web will help businesses grow, power education for the next generation and create growth for the Indian economy. 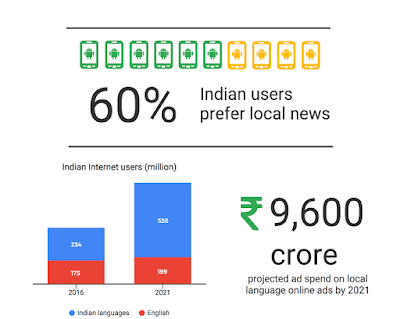 While the local language Internet usage is growing at an unprecedented pace in India, generating great demand for local content as well as revenue opportunity for publishers, there’s still dearth of local language content on the Internet. This continues to be one of the major challenges faced by an Indian Internet user. Our goal with this conference is to help the Indian language publishers make their online content more accessible and useful by making their sites search and mobile friendly. Please note that this is an invite-only event and filling out the form does not guarantee your spot at the conference.